Maple syrup production in West Virginia has increased by about 30 percent each year since the state Department of Agriculture began keeping track in 2016, and that’s partly due to new technologies that make producing large quantities of syrup more efficient for farmers. We’ll hear from several maple producers in the Mountain State, some who have been working for decades, and one who just started this year. We’ll also talk with a farmer, food writer and chef, Mike Costello, who runs Lost Creek Farm in Harrison County, W.Va., about his favorite stories from the history of maple syrup production in these mountains, a practice that dates back thousands of years to when Native Americans used it as their main sweetener. 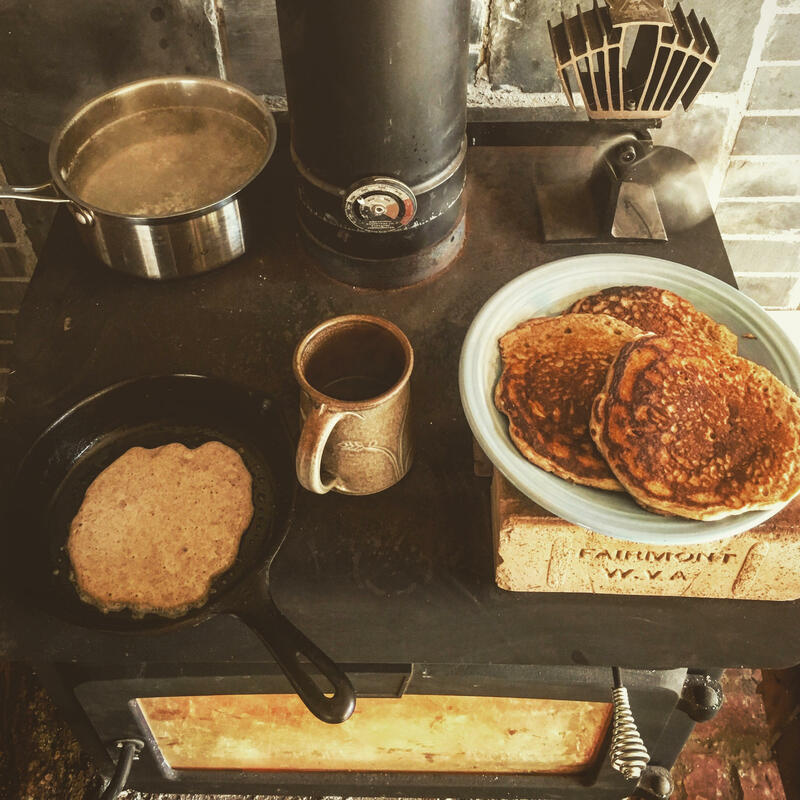 Costello, who prepares Appalachian meals across West Virginia and in some mid-Atlantic cities with his wife, Amy, will share a few tips for cooking with maple syrup. (Check out his recipe for Maple-Glazed Garden Greens.) He’ll also give us some insights on cooking with local ingredients. Although Appalachian cuisine is often regarded as high in fat and sugar, Costello argues that plants – including preserved vegetables, ramps and other springtime greens – and lean meats like rabbit and venison are the foundation of traditional Appalachian cooking. Many of these time-consuming traditions have faded over time, but Costello said he’s hopeful that more people will reconnect with their past. “It’s kind of cool to see that in this moment, where Appalachia is being so stereotyped, that there’s still this opportunity to take back our food heritage,” he said. We’ll also learn more the threat against ginseng root, a valuable commodity grow in Appalachia that’s often steeped in teas or taken as an herbal supplement. While not traditionally consumed here, ginseng is often sold overseas to consumers in China, who willing to pay top dollar for the root: A pound alone can go for several hundred dollars. For generations, selling ginseng has been a source of extra income for many Appalachians. Like maple farming it takes a lot of work to gather a pound of the root, and farmers spend several decades waiting for their plants to mature. But thieves and poachers are making it even harder to harvest, and the situation may be getting worse. Journalist Eileen Guo spent a day in southern Ohio last fall, exploring what the ongoing conflicts between ginseng farmers and poachers could mean for this native Appalachian plant. And finally, we’ll explore a program in West Virginia that’s teaching medical students to cook healthy foods. The idea from West Virginia University and Charleston Area Medical Center aims to encourage future doctors to prescribe healthy eating to help prevent diseases like diabetes and heart disease. The stories featuring maple producers Brandon Daniels and Jeremy Ray were produced by the West Virginia Department of Agriculture, as part of a collaboration between the agency, West Virginia Public Broadcasting and Inside Appalachia. Check out more from our “Appetite Appalachia” series to find more stories about foods, restaurants, and recipes with Appalachian roots. We also had help this week from 100 Days in Appalachia and Appalachia Health News. Roxy Todd is our producer. Eric Douglas is our associate producer. Our executive producer is Jesse Wright. Our audio mixer is Patrick Stephens. You can find us online on Twitter @InAppalachia.